Restylane® Lyft, formerly known as Perlane-L®, is a hyaluronic acid dermal filler used to treat facial wrinkles and folds and replace any lost volume in the face and hands. 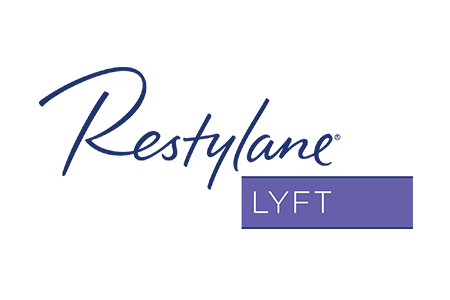 Restylane® Lyft is specifically designed to treat the cheeks, mid-face, and back of hands. The gel particles found in Restylane® Lyft make it a preferred option to lift and fill these areas of the face and hands. How long do Restylane® Lyft treatments last? In a clinical trial involving 200 subjects, investigators observed that 90% of subjects treated with Restylane® Lyft showed an improvement in fullness in the right and left midface areas (combined) at 2 months, and 54% of subjects showed an improvement at 12 months. Additionally, 95% of subjects reported that they were satisfied with the appearance of their midface at 2 months, and 73% of subjects were satisfied at 12 months. What are the potential side effects of Restylane® Lyft? After your treatment, you may experience side effects, such as swelling, redness, pain, bruising, headache, itching at injection site, and tenderness. These are typically mild in severity and normally last less than 7 days. Through nonsurgical injections, Restylane® Lyft is specifically designed to add fullness to the cheeks, midface area, and the backs of the hands, which can result in a more natural-looking, youthful appearance.